Q: We have noted that Foreign Minister Wang Yi made some remarks on China-ASEAN relations during his visits to Thailand and the Philippines. Yesterday he also had a group meeting with the ten ASEAN countries' ambassadors to China. China has been stressing the great importance of China-ASEAN relations. So, is China pleased with the development of China -ASEAN relations now? A: As you said, China attaches high importance to China-ASEAN relations and always regards ASEAN as a priority of its neighborhood diplomacy. This year marks the 50th anniversary of the establishment of ASEAN, and next year will be the 15th anniversary of the strategic partnership between China and ASEAN. With the concerted efforts of China and ASEAN countries, China-ASEAN relations have been developing with a sound and stable momentum, maturing from a fast-growing period to an upgrading phase. When it comes to China-ASEAN cooperation, our consensus is solid, the outcomes are plenty, and the prospect is bright. Regarding Foreign Minister Wang Yi's visits to the Philippines and Thailand, we have released relevant information. When meeting with the ten ASEAN ambassadors to China yesterday, Foreign Minister Wang Yi raised a three-point proposal on developing China-ASEAN relations. The first is that China-ASEAN relations need to focus on the future and usher in a new period. The second is that East Asia cooperation needs to seize opportunities and forge a new prospect. The third is that we need to sustain the positive momentum on the South China Sea issue and get rid of disturbances. Q: The Cambodian government has deported to China Chinese nationals who are suspected of involvement in telecoms fraud cases. Taiwan said that some people are from Taiwan and should be sent back to Taiwan instead of the mainland. What is your response to this? 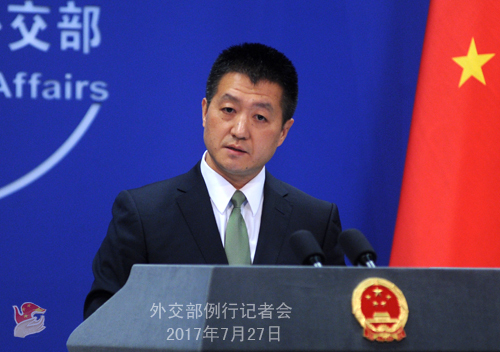 A: China highly commends Cambodia's cooperation with China to crack down on cross-border crimes including telecoms scams. China and Cambodia have been in close communication and cooperation in this field. As for Taiwan's response, it is not a diplomatic issue. I would refer you to the Taiwan Affairs' Office of the State Council for the mainland's response. Q: According to the BBC, US CIA Director Mike Pompeo said in his first interview that China, Russia and Iran pose as great threats to the US in the future, but China is the biggest threat because of its stronger economy and increasing military capabilities, denting the US strength around the world. He also mentioned issues like Chinese takeovers of US hi-tech companies and cyber-theft of US commercial and military secrets. What is your response? A: I have noted relevant reports. If we follow his logic, the conclusion seems to be that the most economically and militarily powerful country will bring the biggest threat to the international community. Is that right? We have said many times that China upholds an independent foreign policy for peace and China's development is for peace and cooperation. We will not threaten other countries, nor undermine other's interests. However, we will not allow other countries to threaten China or undermine China's interests. So, the key is to look at state-to-state relations from the perspective of building a community of shared future, rather than cling to the mindset of zero-sum game that belongs to the Cold War. As for China-US relations, the past 40 years or so since the establishment of diplomatic ties have proven that the two sides have a vast range of common interests. Cooperation is the only right choice for the two countries. China and the US should follow the consensus reached between the two heads of state and pursue the sound and steady development of bilateral ties along the right track in the spirit of non-conflict, non-confrontation, mutual respect and win-win cooperation. Regarding Chinese companies' takeover of US companies and other specific issue Director Pompeo mentioned in the interview, China-US economic ties have been growing for 38 years, during which time businesses on both sides have been conducting normal commercial activities following the rule of the market. We believe that if it had not been for the interests of the US companies, they would not have bothered to do it. 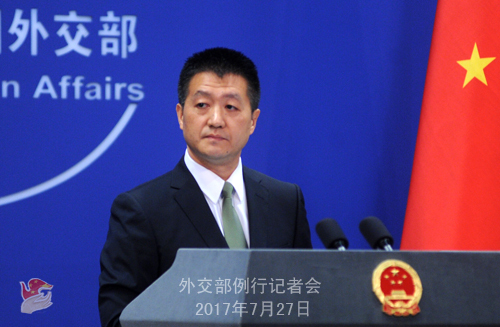 On cyber security issue, China firmly opposes all forms of cyber espionage and cracks down on all kinds of cyber-attacks. We would like to work with the international community, including the US, to forge a peaceful, secure, open and cooperative cyber space based on the principle of mutual respect and mutual trust. Q: Today is the deadline that the ROK set for the DPRK to respond to its offer for talks. So far, the DPRK hasn't made any response. Is China disappointed? A: First, the latest information I have at hand is that the ROK side said that there is not a fixed deadline to their proposal, which of course needs to be verified. Second, you asked whether we feel disappointed. We have spent so many years devoting ourselves to improving relations between the DPRK and the ROK, bringing all relevant parties back to the negotiating table, and seeking a political settlement of the Korean Peninsula nuclear issue through dialogues. Do you think we would easily be disheartened by some little setbacks? Third, China's consistent position is that we encourage and support the DPRK and the ROK to talk to each other which we believe will help reduce tension on the Peninsula and create a favorable environment for the proper settlement of the Peninsula nuclear issue through dialogues. Q: This March, some Japanese were arrested in Hainan province and Shandong province. The Japanese government said that four of them were released. Can you confirm that? A: We said before that the relevant department in China carried out investigations into these six Japanese nationals who were suspected of involving in illegal activities. At that time, we timely informed the consular officials of the Japanese Embassy in China in accordance with the Consular Agreement between China and Japan. As for the latest development you mentioned, I am not aware of that. I would refer you to the competent authority. Q: According to the AFP, the Russian Defence Ministry said that it had deployed military police and set up checkpoints and observation posts to enforce two de-escalation zones. Is China aware of this? What is your comment? A: The proposal to establish "de-escalation zones" is an important measure to ease the tense situation in Syria and realize ceasefire and cessation of violence step by step. 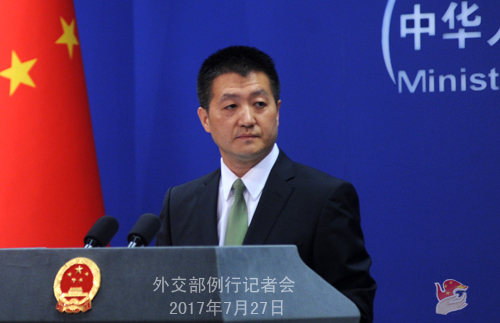 China welcomes the positive efforts made by the relevant party to ensure an effective implementation of this proposal on the basis of fully respecting Syria's sovereignty, independence and territorial sovereignty. The key at this moment still remains to be creating beneficial external environment for the Geneva peace talks on politically resolving the Syrian issue. Q: On July 26, Foxconn Chairman Terry Guo announced that he will invest $10 billion to open a new plant in the US. How does China view this investment? Considering that Foxconn hires almost 1 million people in China, do you worry this may cause an erosion in China's employment opportunities? A: At the Foreign Ministry's press briefing, we could not give specific comments on each and every commercial behavior. As for Taiwan's investment in the mainland, it is also outside the remit of the Foreign Ministry. I would refer you to the Taiwan Affairs' Office of the State Council. Q: The latest edition of Indian Today carried a Chinese map on its cover which does not include Taiwan and Xizang. What is your response? A: Do you really think this kind of tricks is worth your time and attention? Q: Today is the first day of the BRICS meeting on national security issues. Can you give more details? A: I have talked in detail about the 7th meeting of the BRICS national security officials. At present, I have no further information to offer. Q: Australian Foreign Minister Julie Bishop called on China today to do more to contain the threat of the DPRK's nuclear and missile programs. 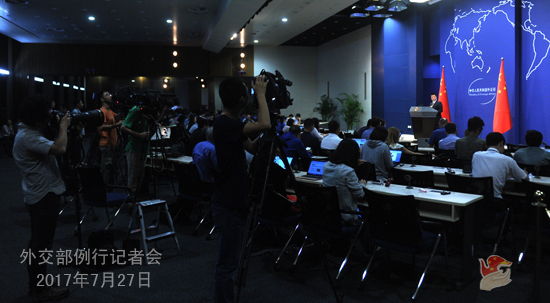 She said that the foreign investment flows and the technology flows of the DPRK are all in China's hands. China once said that it is time to put an end to the China Responsibility theory, but today Ms. Bishop seems to be throwing out the old argument again. What is your response? A: As we have said, in retrospect of the evolvement of the Korean Peninsula nuclear issue, it was amid dialogues that progress was made on the issue. And it was amid continuous and unrelenting pressurization from relevant countries that the situation on the Peninsula gradually got out of hand and the DPRK accelerates its steps towards possessing and developing nuclear forces. Fundamentally, the Korean Peninsula nuclear issue was not caused by China. So, the key to its settlement today does not lie in China's hands. As a major neighbor, China has been working with the international community to seek a proper settlement of the Peninsula nuclear issue through dialogue. China's position is quite clear. First, we are committed to realizing denuclearization on the Korean Peninsula. Second, we are committed to maintaining peace and stability on the Korean Peninsula. Third, the Peninsula nuclear issue can only be resolved in a peaceful way through dialogues. Tomorrow's press briefing will be the last one before the summer recess begins. Due to scheduling reasons, tomorrow's press briefing will start at 2:30 p.m. at the same venue.